Two common problems of spiritual practice are that 1. a practitioner doesn't know where he or she is at in terms of attainments relating to the final goal of full buddhahood and 2. there has been no universally applicable method in finding out exactly the level of attainment of teachers. Both of these factors cause ignorance and confusion. It would be very helpful if we could answer both of these questions with certainty. The Open Heart Bhumi Model, as presented here and in the Bhumi Study Series, offers a way to answer these questions. I am happy to present this system of mapping spiritual attainments and offer it to everyone. With the skills of mindfulness and clear perception, it is possible to be learned by anyone and is applicable to anyone regardless of spiritual orientation. When applying the Open Heart Bhumi Model (OHBM) it doesn't matter which tradition, teacher, master or practitioner is concerned. This bhumi model transcends the conceptual and terminological differences of traditions, and often hard to understand descriptions of stages without in-depth study of that particular tradition. Although terms and descriptions are also useful and necessary, this bhumi mapping system gives a different spin on the issue because it is not based on words and verbal descriptions. Rather, it is based on distinct observation of energy and awareness of the recipient performed by someone who has learned the system. The OHBM is a way to know whereone is at or where someone else might be in regards to his or her spiritual attainment. The Open Heart Bhumi Model is a great step towards a more complete presentation of pragmatic dharma. The Open Heart Bhumi Model is based on the energy system of man, and for this reason is universal. Without studying it, it will make a little sense, if any. That being said once one begins to study it systematically observing oneself, empirically meditating (visiting) one's own bhumis and observing bhumis in others, it starts to make sense. This has been seen with people who are learning it. And yet, it might take many years of regular study to become an expert in bhumi analysis. I first learned the bhumi model in early 2014 from a mahasiddha called Thirumular, with whom I studied for several years. After continuing my studies with Machig Labdron, Padmasambhava and others, the same model has served well in mapping various shifts of my own and of others. The OHBM contains 13 bhumis. The first 10 of those are related to the samsaric mind (tib. sem) that stores karmic traces and the highest three are related to one's own innate buddhahood, three different levels of them. 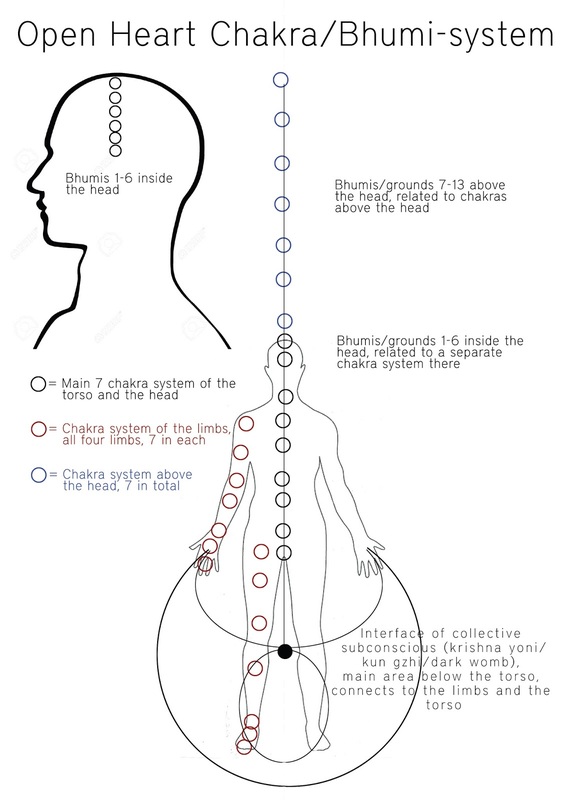 Bhumis, literally "grounds", are vibratory fields of our mind and awareness (tib. sem nyid). These grounds are directly connected to our subtle body, or body of energy that is often called "mind" (tib. sem). Bhumi centers are stacked in each other like a stack of 13 plates. Every human being has the same energy body, the same structure of centers (skt. chakra) and channels (skt. nadi). For this reason anyone with enough skills in mindfulness and instructions can visit one's own bhumis. Visiting or emulating bhumis means that one consciously enters a certain vibratory rate relating to a certain subtle center which then affects the whole energy system or in other words, one's mind. All bhumis can be visited. Opening of bhumis means that one or several of the "bhumi plates" become punctured. The difference between visiting and opening a bhumi is that when a bhumi opens up it has a permanent effect on one's mind while a visit only has a temporary effect. Opening of a bhumi can be a small crack, a small hole or a big hole in the bhumi center. Depending on how big the hole is, is why awakening experiences are more or less dramatic leaps. Having said that even a small crack will make a notable difference on one's being. It is important to understand that while regular spiritual practice has an effect on the mind, bhumis do not open if the 1st bhumi is not open. For this reason opening of the first bhumi (awakening, seeing to one's true nature) is very important. Opening of a bhumi, on the other hand, does not mean that one would perfect it. Perfection of a bhumi means that all karmic records stored in the subtle centers and channels connected to a particular bhumi, become released (dzogchen) or transformed (tantra). Here, the particular bhumi plate disappears and no longer causes any kind of energetic sensations, from negative to positive mind states. Perfection of the whole karmically related bhumi system (bhumis 1-10) would indicate full nullification of dualistic mind (all karmas and samskaras) and the attainment of the first stage of buddhahood (tib. trekcho, cutting through), relating to the 11th bhumi, also called the 1st mahasiddha bhumi. At this point one will no longer have any impulsive energetic (mental, emotional or very subtle/ alaya vijnana) occurrences at any time of the day or night. In traditional terms at this stage one has become a nirmanakaya buddha, buddha in human form by attaining or realising the dharmakaya, or ultimate nature of mind. The next stage from here is to attain 12th and 13th bhumis, or 2nd and 3rd mahasiddha bhumis by the means of leap-over or jump-over (tib. thogal, thögal). The leap-over means that the former attainment of nirmanakaya buddhahood is taken or expanded to the energy body and it's basic elements. When this has been partially attained, it relates to the small rainbow body which can be observed at the time of death by various mystical occurrences such as visible rainbow coloured lights and emanating of mantric sounds, as well as through extensive shrinking of the physical corpse. If the leap-over is fully attained it relates to the perfection of the 13th bhumi, or 3rd mahasiddha bhumi and the attainment of the full rainbow body (tib. jalus, jalu phowa chenpo, འཇའ་ལུས་) when mystical occurrences also take place but no physical corpse remains except hair and nails. Here one has leaped from being a nirmanakaya buddha to being a sambhogakaya buddha, or a buddha with the perfection of the energy body of basic elements. See also this video for explanation. 1. Awakening, opening of the 1st bhumi. Awakening is also called by terms such as (jap.) kensho, or stream-entry (p. sotapanna). Related to the subject-self. 2. Mind purification, opening and perfecting of bhumis 2-6-10. Related to the numerous object-selves. 4. Mahasiddha bhumis, opening and perfecting of bhumis 11-13. Three stages of buddhahood. 1. Awakening. Awakening has been extensively covered and described in materials offered by Open Heart. 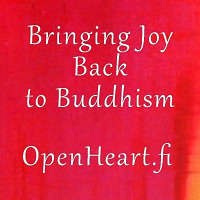 Refer to the website for more www.openheart.fi. When observed energetically, awakening, or insight of selflessness caused by perceiving "me" or "I" as an illusion, takes place at the location behind one's eyes inside the head. When the illusion of "me" as an independent separate entity drops off, this location opens up energetically and the eyes get a natural, relaxed and bright look to them, especially immediately after the opening. Post-awakening this bhumi center location is open and will not close again but may become blurry when strong emotions (object-selves) arise from the subconscious mind and create momentary selfing. 2. Mind purification. After the first bhumi has been opened, one's subsequent practice causes further mind purification which relates to opening of the following bhumis. The bhumi centers inside the head (2-6), stacked on top of each other, relate to the energy body inside the physical body and particularly to the centers in the four limbs. Bhumi centers 2-6 open up with the purification or transformation of these centers. This can be called "growing in the insight of emptiness". Each opening has an effect both on one's meditation as well as daily living. With the opening of the 6th bhumi, one's mind becomes significantly clearer than before, although there is a lot to go in opening the following bhumis and perfecting of them all. Opening of the 6th bhumi makes a great difference for the person him- or herself. However, at times one's mind can get very clouded. As a general note, opening of the 6th bhumi is quite rare among all schools of buddhism and otherwise. In sects where practitioners manage to open their 1st bhumi, they usually progress a few more bhumi openings but then hit a wall. There are exceptions to this but in general, few are able to open the 6th bhumi. This means that practitioners and teachers of this stage or lower still have a lot of karmic knots in their energy bodies, translating to dualistic illusion in their mind, seen in how they act, what and how they teach and how they carry themselves. 3. Bodhisattva bhumis, four stages. The first four centers above the crown, are related to bhumis 7-10 and are called "bodhisattva bhumis". Openings of these makes one's mind clearer and clearer while at the same time one's practice and meditation stirs up stuff deeper from the subconscious mind and substrate consicousness (which are two slightly different things). Here one mainly works with apparent or subtle forms of dullness and paralysis caused by the substrace consciousness (alaya vijnana, kun gzhi). The difference of awareness (rigpa) and substrate is something that the dzogchen masters underline. After the opening of the 6th bhumi and further openings, one can easily mistake substrate for awareness. This is fairly common. The difference of the two becomes very clear with the opening of the 1st mahasiddha bhumi (11th). Generally very few traditions produce practitioners who proceed to bhumis higher than the 6th but fortunately some do. Tantric buddhism (vajrayana) and dzogchen are the strongest in this sense. High lamas of various lineages are usually on bodhisattva bhumis (7th-10th) trying to perfect them. 4. Mahasiddha bhumis, three stages. With the opening of the 11th bhumi, awareness (tib. rigpa) becomes pronounced even though the previous bhumis aren't yet perfected and mind impulses still occasionally happen. When the 11th and the following mahasiddha bhumis open up, awareness is one's default mode. It is clear, lucid, vastly open and unobstructed most of the time. This clarity and openness simply is there, there is no need to seek or enhance it. The opening of the first mahasiddha bhumi is a game changer as it puts one's practice and living in a different light. The relationship of mindfulness and awareness can be realised. This opening also helps one to see why dzogchen or Great Perfection is the king of all buddhist vehicles. In Open Heart we have the so called 13 Pure Land Jhanas and their concerned buddhas for distinquishing whether one has perfected bhumis. For more information see our website. Here is a documentation of videos of my own and those of Open Heart-practitioners, bhumi openings and mind purification since 2/2013 starting about one year after the initial awakening (1st bhumi). You can observe a notable change between videos which is caused by bhumi openings. In my case the progress was caused by Tibetan Heart Yoga, tantric Guru Yoga and Dzogchen Atiyoga. Observe carefully. Click here for Kim's Bhumi Videos and Documentation. Click here for Open Heart Bhumi Videos.